Owen Davis fought in the American Revolutionary War and like many men who fought in that war did so for freedom. The freedom to live your life without the oppressive yoke of government restrictions and taxes. With the end of the war the westward expansion exploded. Davis moved into the frontier and found this unique gorge of the Little Miami River. It is here he built his first mill. With the help of his son-in-law General Benjamin Whiteman he would also construct a sawmill and a distillery. Soon a small town arose around the enterprise and the new town was named Davis Mills. In 1810 Davis sold the mill to Robert Patterson who changed the name to Cliff Town. The Little Miami River supported other grist mills as well as a woolen mill, barrel mill, paper mill and a sawmill. 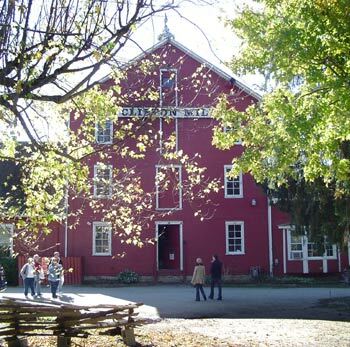 The present building which is Clifton Mill was built in 1869 by the Armstrong family . It would stay in the same family until 1948 when it was abandoned. On a hike in 1962 Robert Heller discovered the old mill and was responsible for placing it on the path to restoration. Today the mill and Clifton itself is a portal into American History. Learn how a mill works, take in a marvelous view of the river and enjoy a delicious meal. The Millrun Restaurant sets in the back of the building offering both breakfast and lunch. Relax to the sound of falling water as you enjoy a home cooked meal, all the while the Little Miami races below. 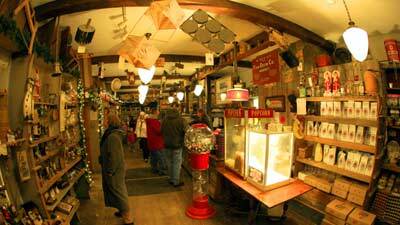 On the other side of the mill is the Mill Race Gift Shop that offers a variety of confections and nostalgic gifts. And for a real treat, don't miss the extravagant Christmas display that runs from Thanksgiving to New Years. The Christmas lights have been an Ohio tradition since 1988 when Clifton Mill owner Tony Satariano and his son started decorating the mill. 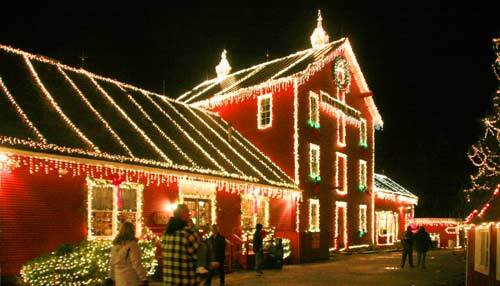 Christmas in Clifton Ohio November 23 - December 31 The old mill becomes a dazzling light show during the Christmas season as it displays millions of lights. If you have been to Clifton Mills during the year or if you have never been to the mill, a trip during the Holidays is unique and amazing. The transformation is splendid and the family will love it. 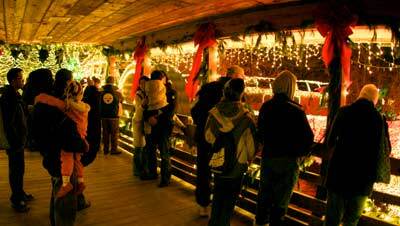 There are about 3.6 million Christmas lights at the mill, a very large animated miniature village complete with a football stadium where the Ohio State Buckeyes are taking on the team up north while the animated band does Script Ohio. There is also a display of nostalgic toys and a workshop where Santa can get a little work done now and then. 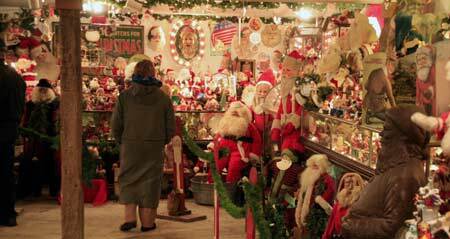 The Satarianos have been collecting antique Santa dolls for almost a half century. Today there are over 3000 Santa Claus dolls and figures on display in the Santa Collection Room. There is an admission charge for the Christmas light display. It is $10 for adults on weekends with free parking. The parking area is non-paved, so depending on the weather it can be pretty muddy. Once you pay to get in, all the other displays are included. The tiny town of Clifton has been serving the needs of Ohio's public for years. In the 1820s the town served as a stop on the Accommodation Line stagecoach that traveled between Springfield and Cincinnati. The 80 mile trip usually took 2 days depending on the weather and would cost about $5.00 for a one-way ticket. Did you know : OSU football coach, Woody Hayes, was born in Clifton Ohio where his father was superintendent of the Clifton Union School. Built one of the first log cabins in Green County Ohio. The cabin a small 25 foot square building was given to Owen Davis who then leased it to Peter Borders as a tavern. This small square wooden building became the first courthouse of Greene County Ohio. General Benjamin Whiteman would become one of the first three associate Judges. The cabin was torn down in 1850 and today a state marker is located near the site of the cabin.